For the 24 hours to 23:00 GMT, the EUR traded flat against the USD and closed at 1.1331. On the macro front, data indicated that Germany’s Ifo business climate index slid to a level of 102.0 in November, compared to a revised reading of 102.9 in the previous month. Market participants anticipated the index to drop to a level of 102.3. Moreover, the region’s Ifo business expectations index eased to a level of 98.7 in November, compared to market consensus for a fall to a level of 99.2. The index had registered a revised level of 99.7 in the prior month. Further, the Ifo current assessment index declined to a level of 105.4 in November, more than market forecast and compared to a revised level of 106.1 in the preceding month. In the US, data showed that the US Chicago Fed national activity index rose to a level of 0.24 in October, surpassing market expectations for an advance to a level of 0.18. The index had recorded a revised level of 0.14 in the previous month. On the other hand, the nation’s Dallas Fed manufacturing business index dropped to a level of 17.6 in November, higher than market expectations for a drop to a level of 24.5. In the preceding month, the index had registered a reading of 29.4. In the Asian session, at GMT0400, the pair is trading at 1.1334, with the EUR trading marginally higher against the USD from yesterday’s close. 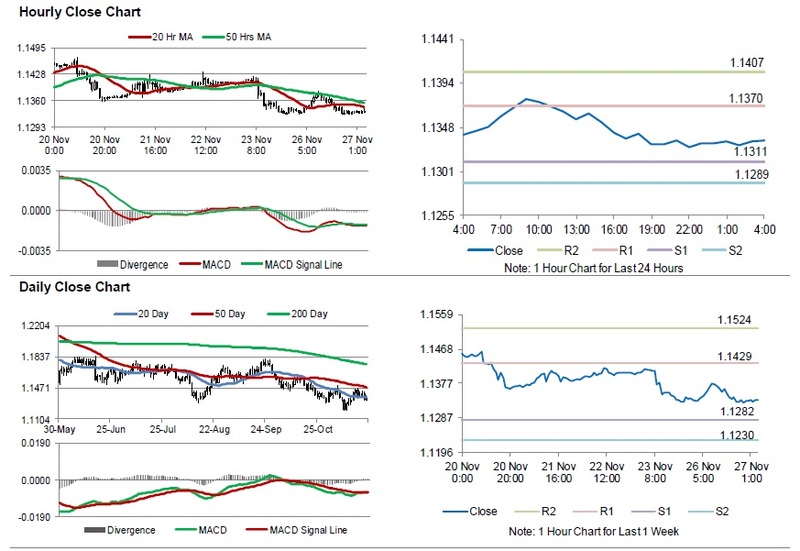 The pair is expected to find support at 1.1311, and a fall through could take it to the next support level of 1.1289. The pair is expected to find its first resistance at 1.1370, and a rise through could take it to the next resistance level of 1.1407. Amid lack of macroeconomic news in the Euro-zone today, traders would keep an eye on the US house price index for September and consumer confidence index for November, slated to release later in the day.